In a letter she wrot to me, she said, “The only thing that I need for the eagles is money to help buy the fish for them…also there is snow plowing in the winter time to open their feeding areas as they cant find their food if it falls in deep snow. I also keep a heated tote to thaw their food out as it is much easier for them to eat it not frozen so my electric bill is very high in the winter time. These are the things that I would use the money for.” Jean Keene. * $250 towards buying fish to feed the eagles. * $350 towards Snow Plowing in the Winter time to open the Eagle’s feeding grounds. Jean died January 13, 2009, may she RIP. Although she had many supporters for the feedings, she was also criticized for drawing a large population of eagles to the area. 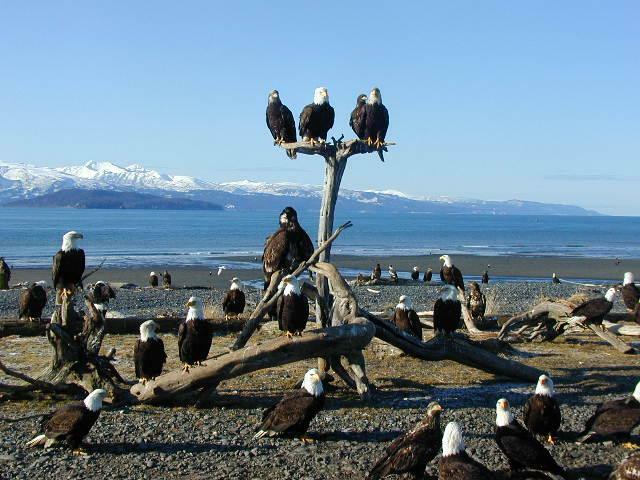 Sadly, after her death, the city of Homer passed a law prohibiting the feeding of predatory birds.